Today’s Sias Studio was though of while doing laundry! 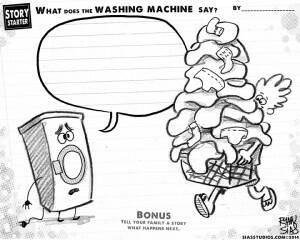 Ryan wondered what it would be like if the laundry machine was alive! (He’s always thinking of strange stuff.) There are 3 projects in today email. A learn to draw, doodle page and writing prompt. Here is the writing prompt. Ryan’s bonus story is….After seeing all that laundry the machine runs away. He goes to an iceberg where he meets Paul the dirty polar bear, who he has to clean up. Think of how crazy the story can go!